I'm slowly but surely working through the fun cast-offs I got at a salvage store, like this legal-size clipboard. First I colored the metal clip with black alcohol ink, then I sponge-painted the board (front and back) with a few shades of blue and green craft paints. I adhered a sheet of art paper to the front with Mod Podge, added a coat to seal it on top, glued ribbon and buttons around the edges. Now it's a much prettier spot to clip bills that need to be paid or paper for a shopping list or a to-do list...or it would also make a super cute clip frame for photos or drawings to hang on the wall or door. I love these shallow, wide-mouth mason jars - they're perfect for storing all kinds of little things. I had fun decorating it - check out my video tutorial and project instructions on Cool2Craft to see how I made them stackable and how I created interchangeable labels. Smoothfoam is indeed the crafter's foam! What's smooth and dense, yet super lightweight? Takes paint and glue and pin-poking and knife-carving and sanding with ease? All this Smoothfoam, that's what! Be sure to check out all the incredible projects for National Craft Month on the Smoothfoam blog...made by a team of super-duper talented designers! Leave comments on the blog posts over there for your chance to win a haul of Smoothfoam and other crafty treats - deadline to enter is 3/31/13. For these ATCs, I started with some cool handmade painted paper with a surface that looks burned and creased. 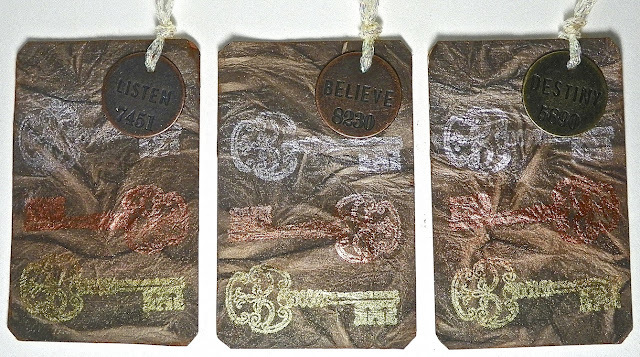 I stamped the keys with Perfect Medium and then brushed over them with Perfect Pearls pigment powders. I love those Idea-ology metal charms, I thought they added the perfect touch. 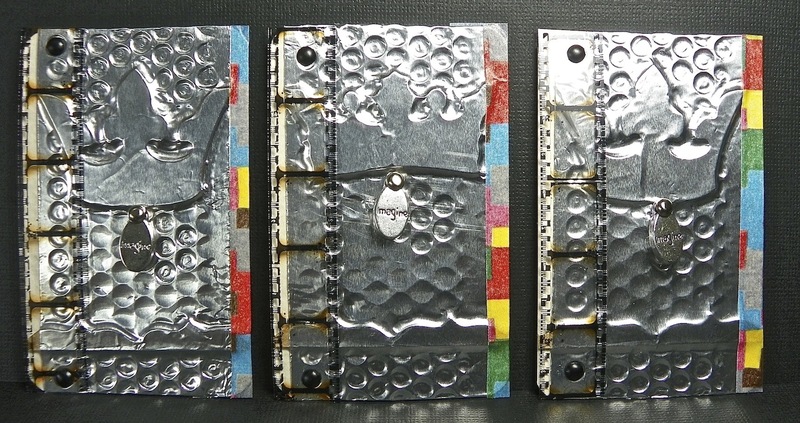 I'm still hooked on this technique of layering chipboard and other elements underneath aluminum metal tape. The theme for my ATC group this month was Silver Screen...fun to make! These spiral beads are really fun to make by needlefelting variegated wool roving. Check out my video tutorial on Cool2Craft! I recently made this greeting card and dog-tag style pendant for Cool2Craft, using my Spellbinder's Grand Calibur and Artisan Explorer die-cutting/embossing machines. Look at all the detail in that filigree frame! Click here for my project instructions and a video tutorial. Die-cutting and embossing adds so much depth and texture to cards - and Spellbinders has gorgeous dies, I must say! Button bracelet with a blog hop & giveaway! I've been wanting to make a button bracelet forever. A couple weeks ago I found a booth at a local quilt show that was selling bracelet blanks, plus I knew this blog hop was coming up - yay! I finally get to make my button bracelet. It's super easy - just pick out some pretty buttons and use a permanent adhesive like E-6000 and glue them on to the blank. I really like these big faux-stitched buttons in a variety of springtime colors. Buttons Galore & More and Viewtainer are sponsoring a blog hop and giveaway with the Designer Crafts Connection - you can win a cute container filled with even cuter buttons and ribbons for all kinds of crafty projects. Go through the blog hop (use the "hop" links under the DCC logo on my sidebar) and then leave a comment on the Buttons Galore blog telling them which project(s) you liked the best. The deadline to enter is 3/17/13 - have fun hopping! Last week my featured project on Cool2Craft was Easter-themed. I thought this was a fun way to decorate eggs with the kids, without all the muss and fuss of hard-boiling and food coloring. It's also a great way to use up small pieces of fabric and felt - and it's mostly no-sew, so it goes together pretty quickly! Click here for the project instructions and video tutorial - spring is right around the corner, yay! Embossed metal tape technique - plus a blog hop with a giveaway! It's the first Monday, which means it's time for a new blog hop with the Designer Crafts Connection! This month we're sharing our favorite craft technique. After you finish here, click on the DCC logo over to the right there in the sidebar and hop to the next blog. Look for the same logo on each blog's sidebar to continue hopping. Details for entering the DCC giveaway are at the end of this post! I have way too many favorite techniques to count, so this is the newest technique I just learned from my friend Lisa...embossing metal tape. You start with a wood or heavy cardstock panel - mine is just 5" x 7". Create a composition of textural, slightly raised elements and glue them down. I used heavy jute twine, chipboard shapes, and a piece of die-cut metal screen. Then place strips of wide aluminum tape across the top and wrap around to the back. Use a dull stylus to gently press and rub the tape to smooth it out so it hugs all the lines and textures. The tip of a small paintbrush handle works well. Go easy, the tape can tear if your stylus is too sharp. I used a metal texture tool and my fingernail in the flat areas to add some interest to the surface. Then I painted it with alcohol inks, lined the edges with a black marker and added a little bling on top. Pretty fun! 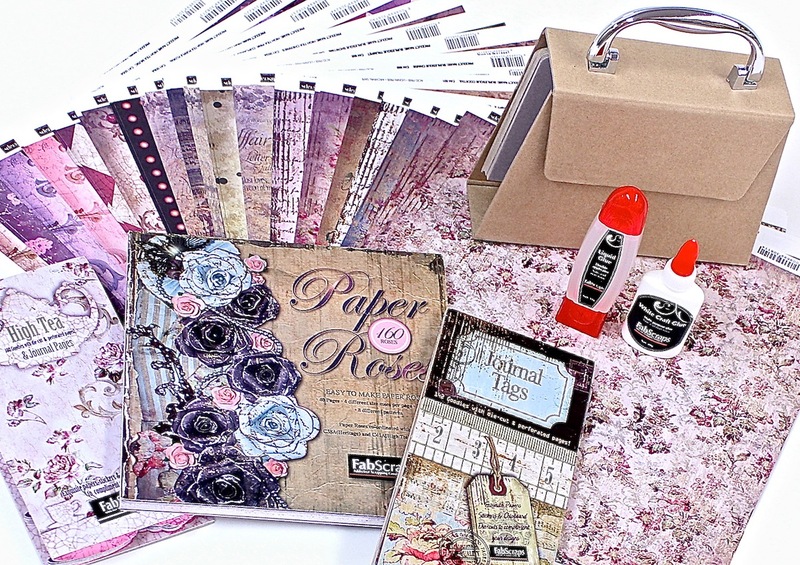 To celebrate National Craft Month, our Designer Crafts Connection has a fabulous selection of products from FabScraps to give away - click here to see this collection featured on Scrapbook Soup. 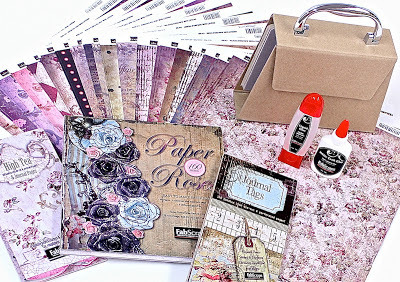 You'll get this super cute chipboard purse album, die cut roses, papers, tags and more. To enter to win, hop through the blogs and then leave a comment on whichever blogs have the technique you think will be your new favorite (pick me, pick me!) and then visit Julie McGuffee's Life in the Craft Lane blog to leave a comment there saying which technique(s) you liked...you have so many chances to win! Julie will pick a winner from all the comments in the hop at the end of March. Good luck! This week I visited another salvage store called Scrap. Thousands and thousands of square feet filled with delightful doo-dads and goo-gaws, antiques, oddities, treasures, junk, and surplus supplies. This was my haul for a mere sixteen bucks! The envelopes are new, in perfect condition...these alone at a regular retailer would cost twice what I paid for everything. Perfect for my card making! I love square cards, even though they cost a little extra to mail. An awesome score - so much to work with! Three cheers for creative re-use!